Photogene is one of those iPhone photo editing apps that I use a bunch, back shelf for a while then ‘rediscover’ it again. 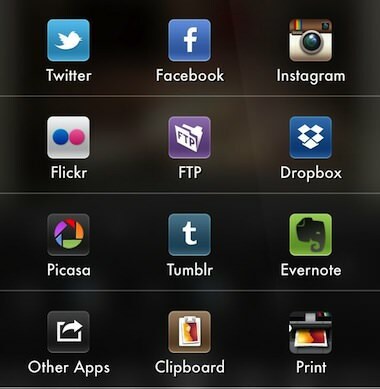 Once again using it a lot as a single app that give the ability to do all the work in one app without silly clutter. Along with the update to the feature set in the new version 4, the app has also gone Universal so you can install it on your iPad for a larger view of your edits. The iPad interface is completely different, I’m only showing the iPhone version here. 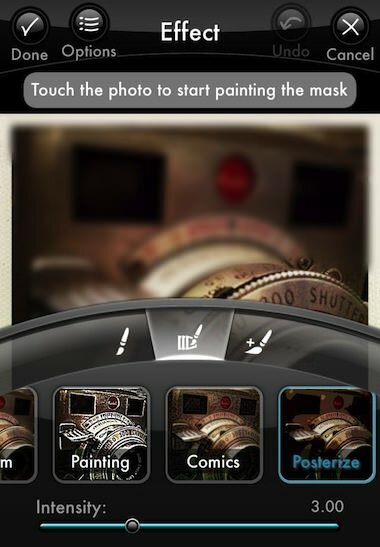 Photogene is now a universal app for both iPad and iPhone. New look for iPad user interface. New icon. The PRO package is now free! Everyone has been upgraded to PRO. Enhanced RAW support. RAW files are now opened in full resolution. Flickr export: can now choose a set. New feature for exporting XMP sidecars. 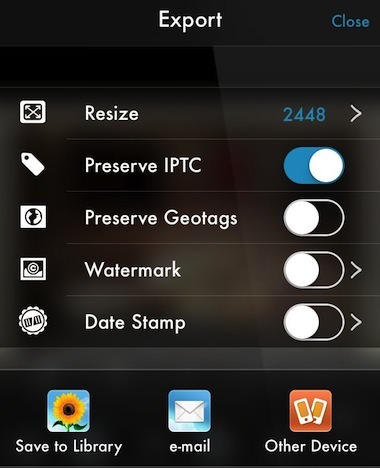 Now, onto actually enjoying the power of the app – After importing a photo, Photogene 4 has a quick access tool pop up wheel to get right in and editing. Fun overall filters that are quick and tunable. 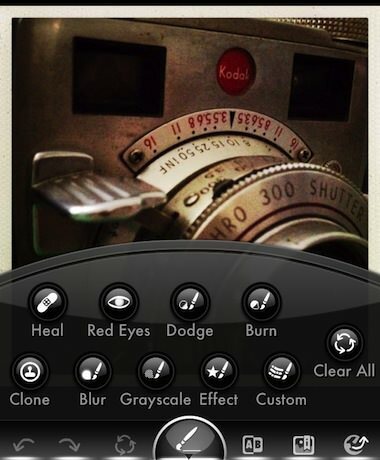 The real power of Photogene 4 though is the specific photo area tuning tools. Notice that at this level, there is also a row of fuzzy undo/redo/restore buttons along the very bottom of the screen for those times you want to throw a bunch of changes out and rethink the image. Each effect can be chosen to be applied to a very specific area of the photo. 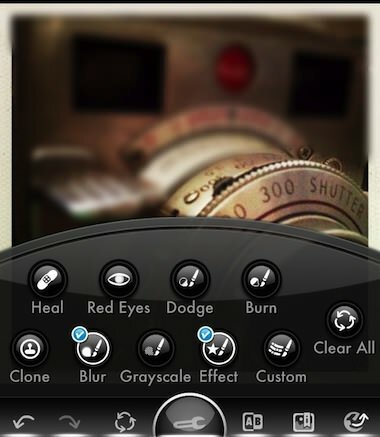 Photogene lets you save/undo/cancel and move onto the next effect. So, you can brighten an area, darken another part of the photos, blur a bit, burn some light… and so on. It’s easy to move from one alteration to the next so doing simple to more detailed edits is pretty quick. When using a tool, don’t miss the ‘Options’ button in the upper area for more adjustments available for that effect. Each of the effects have additional options from the dial. Usually, these start with the basic brush head used to apply the change. Choosing other tools will result in a different sub group of effects within the top level group. 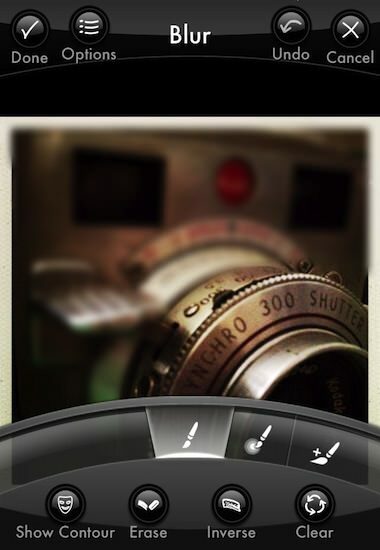 Notice the slider along the bottom, Photogene 4 is not an all-or-nothing filter app. Every time you save adjustment, it is layered on top of the previous work. Returning to the work picker, notice that the features used have a check mark next to them. If you develop a workflow, this is handy to see where you are in the process and to assure all steps got covered. 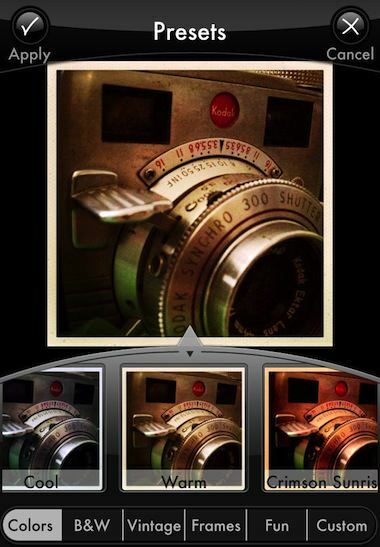 When the image is as you like visually, Photogene offers the ability to adjust pixels to best fit the way you will be using the photo. 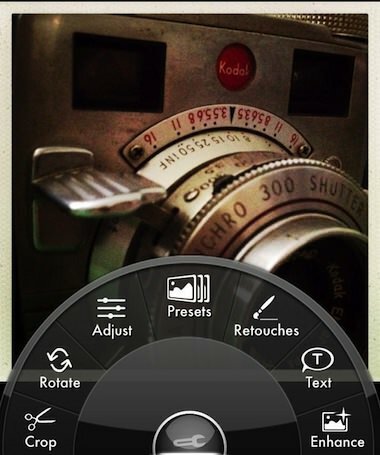 As well, you can review the photo tags, then share through a large variety of options. Speaking of all-in-one without clutter, notice that you can water mark the photo without having to go to another app also… high on my list since I found a recent photo of mine on over 85 sites with no credit.